Careers Cost > How Much Does a Mannequin Cost? How Much Does a Mannequin Cost? A mannequin, also known as a dummy, is usually used by stores, tailors, dressmakers, and others to display or fit clothing. A mannequin is usually life-sized with several points of articulation to strike different poses. The price for mannequins differs depends on the brand, quality, material, type, number of poses and company you purchase from. On average, a mannequin can cost anywhere from $65 to as much as $250 at an online retailer for a simpler no-name branded design. For those looking for a high-end one made from someone known for their craftsmanship could pay upwards of $500 to $1,200. The materials and the size of a mannequin can affect the price. A plastic full mannequin that can strike two to five poses, for example, will retail for $75 to $150. A half body mannequin, which will include the torso and arms, can be half this cost, retailing for about $40 to $65. A mannequin made from a fiberglass or glossy material can cost 100 percent more, often retailing for closer to $185. These are prices for a lower end brand most people have heard of. Smaller children mannequins can cost $55 to $85 for a full body. A head only can cost anywhere from $15 to $45, depending on the material and if the wig is included. Something as simple as a styrofoam mannequin head can cost less than $10. A leg mannequin can cost $10 to $40, and the legs are usually clear and stand with a built-in stand. The Mannequin Madness blog says a mannequin with realistic features can cost $700 to $1,300, while a no-name one imported from Asia can cost $250 to $400. Mannequins can come in all sorts of shapes and sizes. The most common will include the full body, a half body torso, the legs only or just the head. Some may come with the molded hair, while others may strike only one or multiple adjusted poses. Coming as either a male or female, both as an adult or child size, the most common colors will be a beige or dark black. You can even get one pregnant. The four basic styles will be referred to as realistic, abstract headless and bendable. Realistic mannequins will be the most expensive types on the market and will closely resemble facial features like a human. These types are often found in higher-end retail stores such as Nordstroms or Victoria Secret. Commonly made from a fiberglass material, stores purchase this type because it can draw more attention to the material it’s wearing because of the poses it may be able to strike. With an abstract mannequin, the hair will be either sculpted or painted on. Depending on the type you purchase, some may have a futuristic look. With headless, as the name applies, the mannequin will have no head and will stop at the neck. Companies often choose this type because it forces someone to focus on the clothing, not the facial features of the mannequin. Bendable mannequins will have a wire frame that allows you bend it in various poses. These mannequins are commonly used for smaller child-like sizes and often don’t have a head. Upper and lower torsos, as well as the legs alone, will come with a built-in stand. This allows you to place the mannequin on any flat surface without it falling over. Some opt to place wigs on the head attachment. The wigs can cost anywhere from $10 to $30. The clothing and accessories that you want to display will be needed in order to properly display the products. If the stand doesn’t come included, an additional one may need to be purchased separately. If the mannequin will be in the window with sun exposure, a cheaper material may yellow over time. Experts recommend purchasing the mannequin before you buy the clothes since most clothing manufacturers don’t adhere to a standard sizing model. 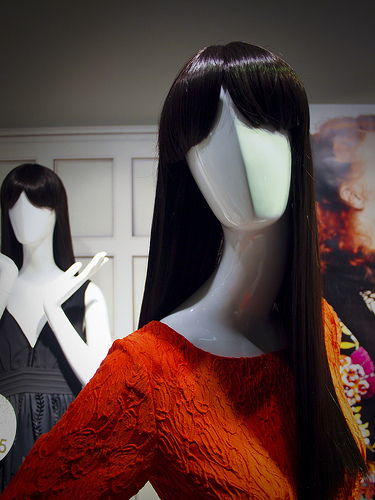 Earrings can be placed in most mannequins as long as they have heads. The ears will have smaller holes which allow you to simply allow you to either hang the earring or bend it to make it stay in place. If you do not need a full-bodied mannequin, torsos and legs are a lot cheaper than the full body. In the mannequin world, you get what you pay for. Brands that charge more will often be made from a fiberglass realistic material that’s designed to last. The cheaper brands will use fewer layers of fiberglass, causing them to be more fragile if they were to tip over. Purchase mannequins sold in bulk in order to take advantage of discounts. Consider purchasing them second hand from stores going out of business or even try websites such as eBay and Craigslist.